There are soccer legends and then there are human beings like Garrincha which grace the sport once in every century. Regarded by many as not only the greatest Brazilian player of all time but also the best dribbler the sport has ever seen. Both Pele and Garrincha are seen as the best in the sport – and no one has yet to come in the same league as these two. Nick named Garrincha by his sister due to his birth defect – he was born with a spinal defect – causing him to have a small and petite frame, he overcame several physical puns and lead Brazil to two historic World Cup wins in 1962 and 1958. 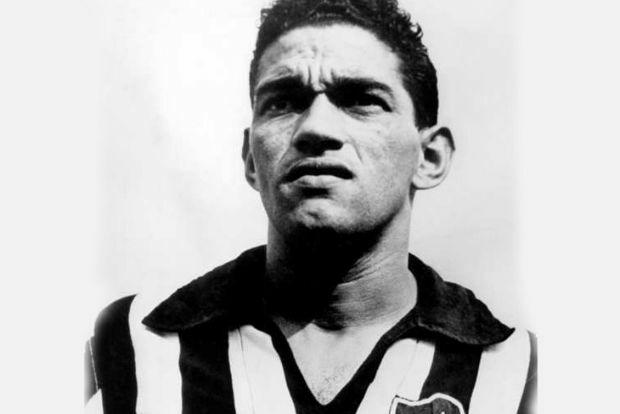 Apart from Garrincha he was nick named numerous other names like Alegria de Poava (Joy of the People), the Player Who Taught Fans How to Laugh, Anjo de Pernas Tortas (Angel with Bent Legs). For many he was the anti-athlete, someone who overcame physical defects to become one of the greatest and most beloved soccer players of all time. Manuel Francisco dos Santos was born in 1933 in Pau Grande, Brazil in a very poor family of six children. Garrincha was born with a rare spinal defect which caused his right leg to be several inches shorter than his left. Growing up in severe poverty never hit Garrincha’s spirit as he remained a carefree child who was always interested in three key things – out of which two would lead to his eventual downfall – women, alcohol and soccer. He was scouted by soccer managers when he was a teenager and signed on with Botafogo. Soon Garrincha started amazing everyone with his unique dribbling ability and gained a reputation for being an athlete who lived by his own rules. He was not only mischievous and brilliant but a breathtaking athlete capable of creating sheer magic on the soccer field. It was stated that the worse mistake an opponent could make was get in front of Garrincha once he had the ball. In terms of playing professionally for his national side, Garrincha made a strong impact in the 1958 World Cup in Sweden alongside fellow team player and future legend Pele. He transformed the Brazilian side into one which would eventually go on to win the tournament that year. Soon Garrincha became a an international icon and a hero in his native country. And it doesn’t stop here, four years later in the World Cup in Chile Pele got injured and Garrincha became his team’s heartbeat and inspired his team to win the 1962 World Cup as well. In that World Cup Garrincha was named as the Player of the Tournament and its leading goal scorer. Garrincha has been named in the FIFA World Cup All Time Team. He has also won the coveted Ballon d’Or in 1962. In 1999 he was ranked 7th in FIFA Player of the Century list. He has also been ranked #20 in World Soccer’s Greatest Players of the 20th century. He has been inducted into the Brazilian Football Hall of Fame.